It’s Poetry Friday and it’s also December 1, which is both the first day of Advent, and the first day of summer here in Australia. So, although I keep thinking it’s ages till Christmas, I guess it is now officially close. It’s also a sign that the school year (which runs from February to December) is coming to a close, and in classrooms across the country, kids and teachers alike are looking forward to school finishing. With all that in mind, here’s a little poem about December – and Christmas – in Australia. as that Christmas is coming. 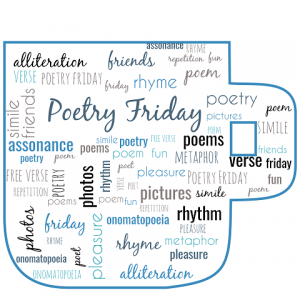 Today’s Poetry Friday roundup is at A Reading Year. Head over there for lots more poetry goodness. Instead of the white Christmas, you have the white sand Christmas or the bikini Christmas. I have to try it one day. I think I’d like it very much. It’s hard for my Northern-Hemisphere-Centric brain to imagine Christmas and summer break at the same time! Your poem is a good window to how those in the Southern Half live!! Thanks! Sally, I concur that your (new?) blog background is looking VERY cool, and I’m loving your poem, so full of familiar mysteries. We get the gist, but what’s a texta? What kind of trees do you put up–are they evergreens? Where do those grow in Australia? 40* indeed! Thanks Heidi. A text is a just a coloured marker pen. texta is a brand, but when I was a kid they were the only brand. A lot fo people do put up ‘real’ trees. they are pines, which are grown specially in plantations. But most people – including us, these days – use fake trees. keeping a pine tree alive for more than a week is very difficult in the summer. First, Wowza on the starry pic of you and that fun ‘scope! It’s GREAT! Thanks Robyn. The photo is courtesy of a dear friend, and the starry background was worked in my clever daughter. I love it! I still have a styrofoam ball covered in glitter that’s 42 years old. Happy Christmas and summer to you! Well done on keeping it that long, Linda. The decorations my kids made hold such memories. 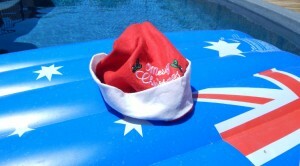 So nice to get a taste of Christmas down under. Fun poem, can’t believe it’s already December!! It’s so much fun learning about Australia from you and Kat! I can picture the scene, so much excitement and so much to think about. Thank you Tabatha. Alan Wright is another Aussie who’s joined Poetry Friday. We are taking over, lol. This is a poem that took me back to my own school days and those of my Kiddo when she was in school. It is just lovely and really captures those school days just before the holidays arrive. Thanks Alex. I think that excitement is universal. Such fun! Yes, my sixth graders are so excited for the holidays, already. I am a retired teacher and know the excitement of vacation coming, but Christmas, at least for most, too would bring added chaos for sure. I love hearing all the Aussie words, Sally, and your poem sails along just as these weeks will! Thanks Linda. I love love love Christmas, but I am glad not to be teaching at this time of year any more. What a fun poem! I can’t imagine the loss of concentration with both the end of school and Christmas wrapped up together! It’s chaos. And although it’s fun, it’s also exhausting for all concerned. Fun poem Sally–it sure must be hard for all those kiddies and even teachers to concentrate right about now. I liked the “gazillion cards” too! Enjoy the holidays as they approach, thanks! Thanks Michelle. I think the end of school year is probably like that whenever it falls, but coming so close to Christmas and with the weather heating up, I think it’s extra hard to focus. Love it Sally. I’ve seen them having to move furniture around too. Oh yeah. The cleaning and stacking of the furniture!